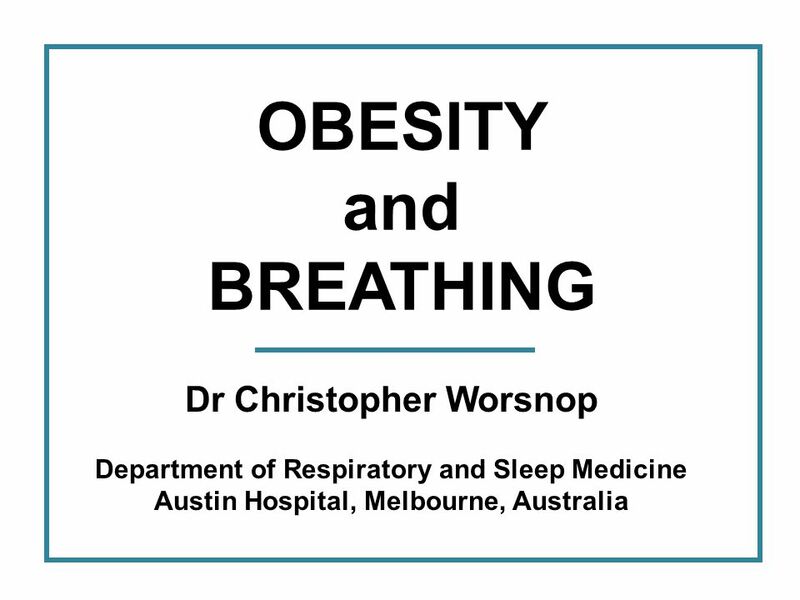 OBESITY and BREATHING Dr Christopher Worsnop Department of Respiratory and Sleep Medicine Austin Hospital, Melbourne, Australia. 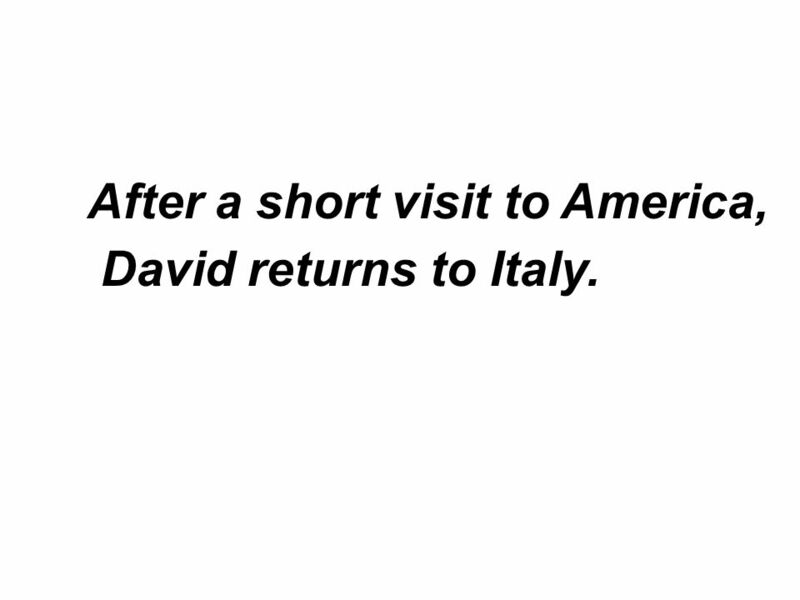 2 After a short visit to America, David returns to Italy. 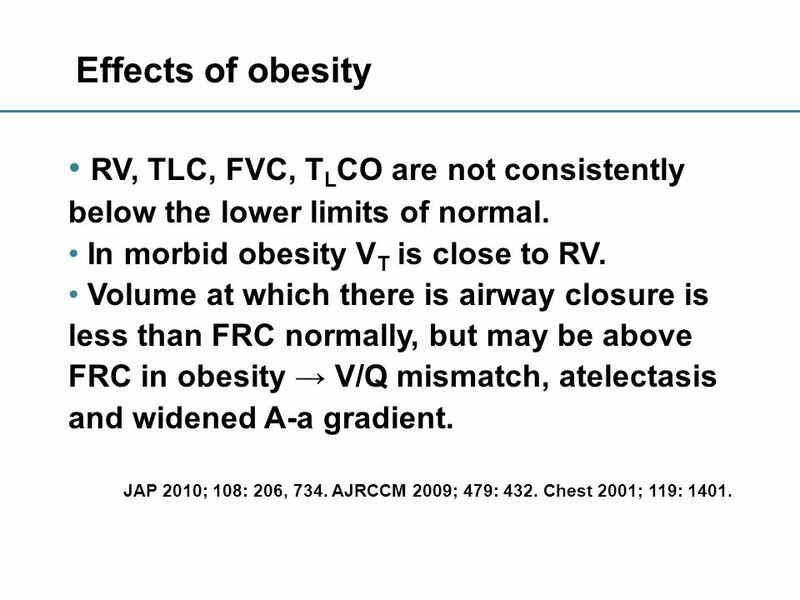 6 Effects of obesity RV, TLC, FVC, T L CO are not consistently below the lower limits of normal. 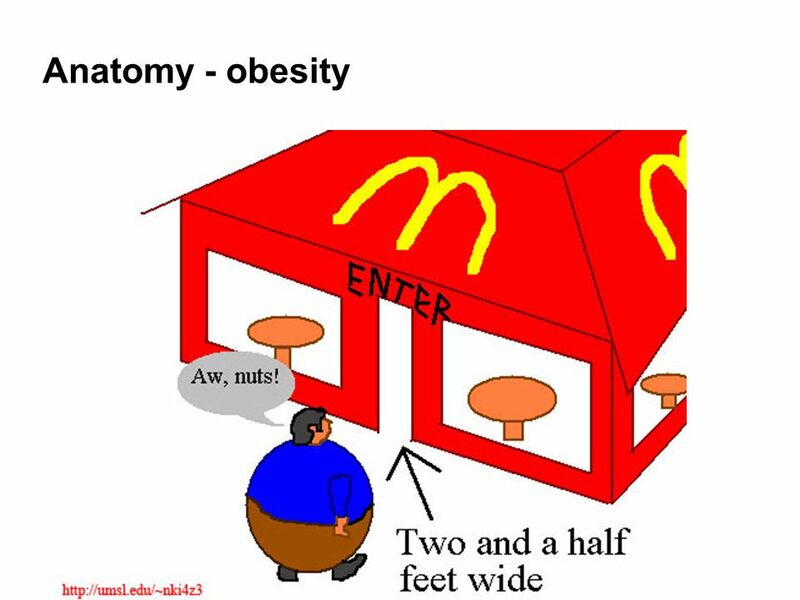 In morbid obesity V T is close to RV. 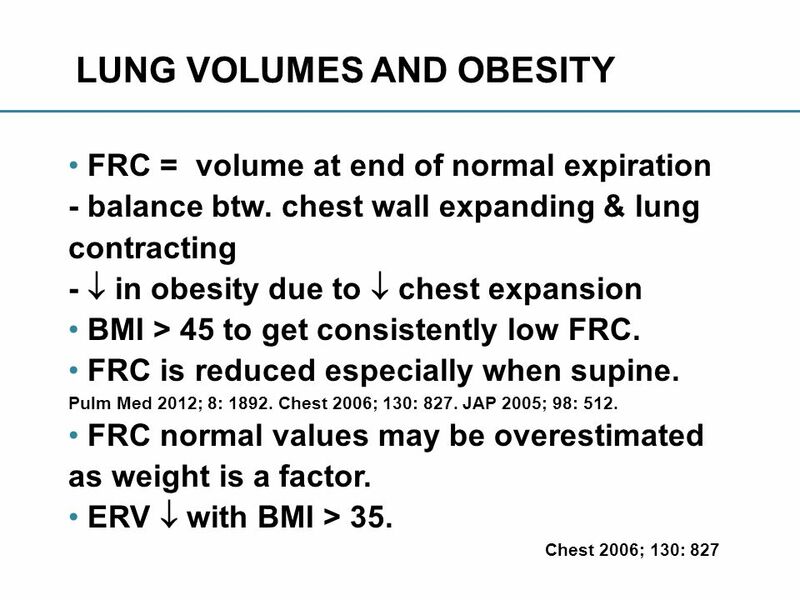 Volume at which there is airway closure is less than FRC normally, but may be above FRC in obesity → V/Q mismatch, atelectasis and widened A-a gradient. JAP 2010; 108: 206, 734. AJRCCM 2009; 479: 432. Chest 2001; 119: 1401. 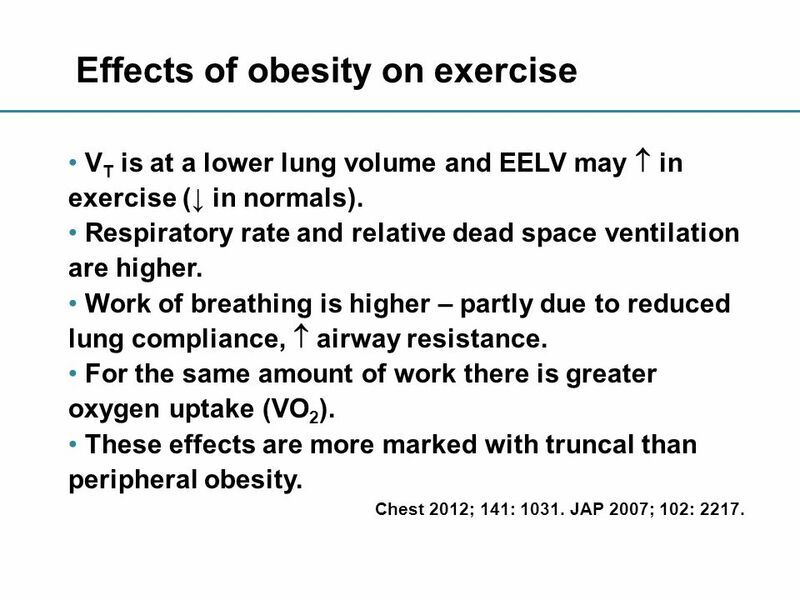 9 Effects of obesity on exercise V T is at a lower lung volume and EELV may  in exercise (↓ in normals). Respiratory rate and relative dead space ventilation are higher. Work of breathing is higher – partly due to reduced lung compliance,  airway resistance. For the same amount of work there is greater oxygen uptake (VO 2 ). These effects are more marked with truncal than peripheral obesity. Chest 2012; 141: 1031. JAP 2007; 102: 2217. 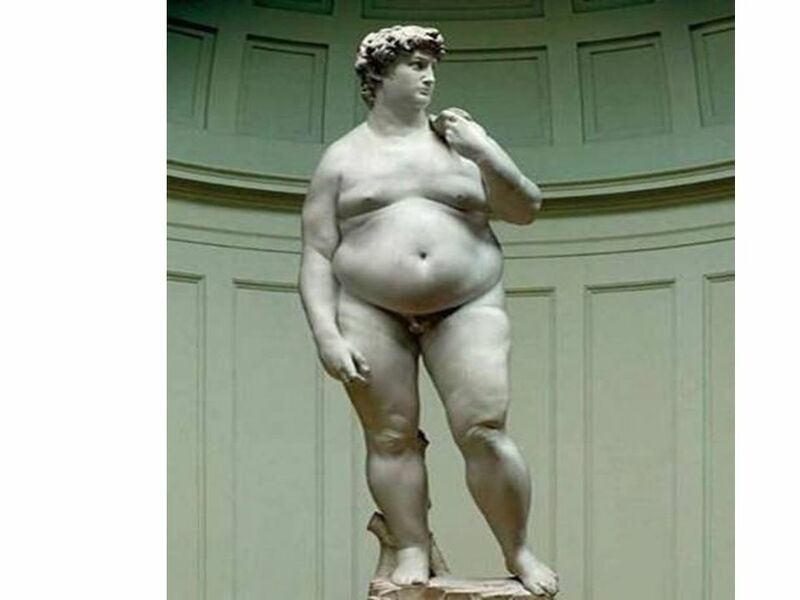 10 REDUCED T L CO Some reference values for women have weight as a factor. 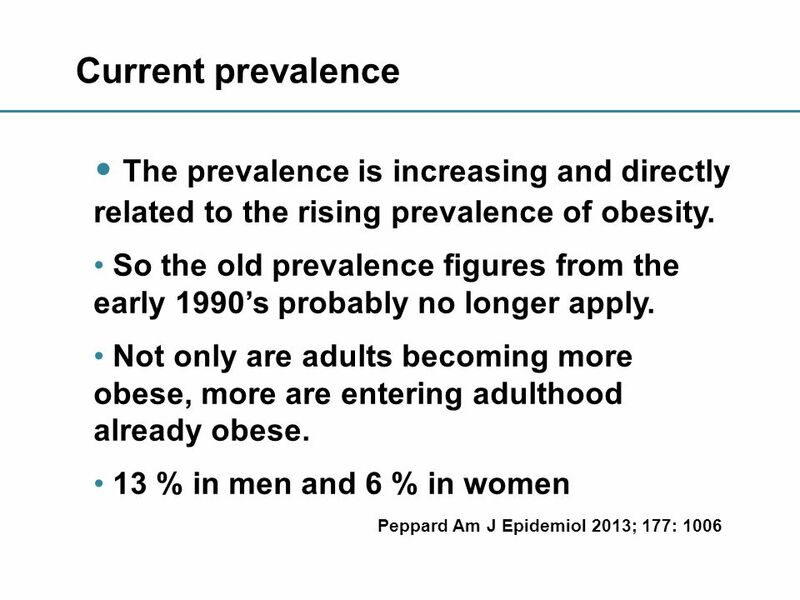 Thus in obese women the cut-off for normal may be artificially high. 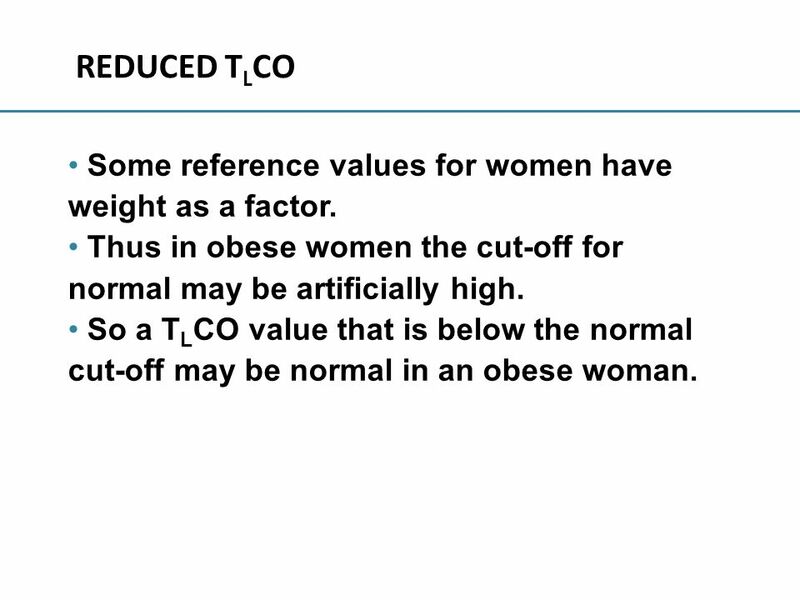 So a T L CO value that is below the normal cut-off may be normal in an obese woman. 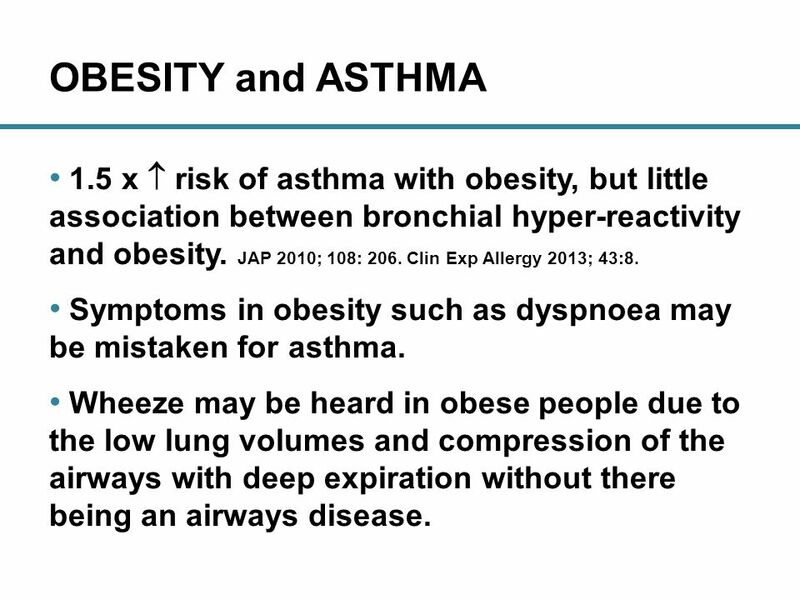 11 OBESITY and ASTHMA 1.5 x  risk of asthma with obesity, but little association between bronchial hyper-reactivity and obesity. JAP 2010; 108: 206. Clin Exp Allergy 2013; 43:8. 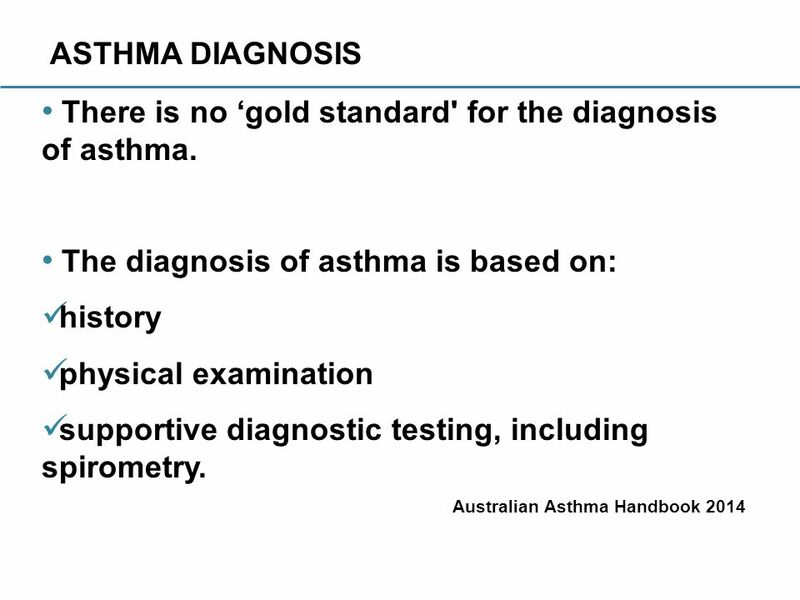 Symptoms in obesity such as dyspnoea may be mistaken for asthma. 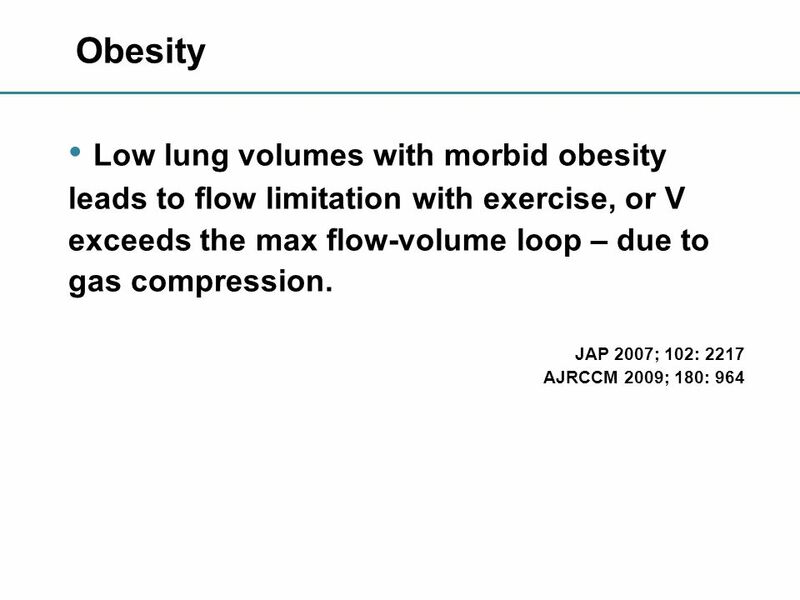 Wheeze may be heard in obese people due to the low lung volumes and compression of the airways with deep expiration without there being an airways disease. 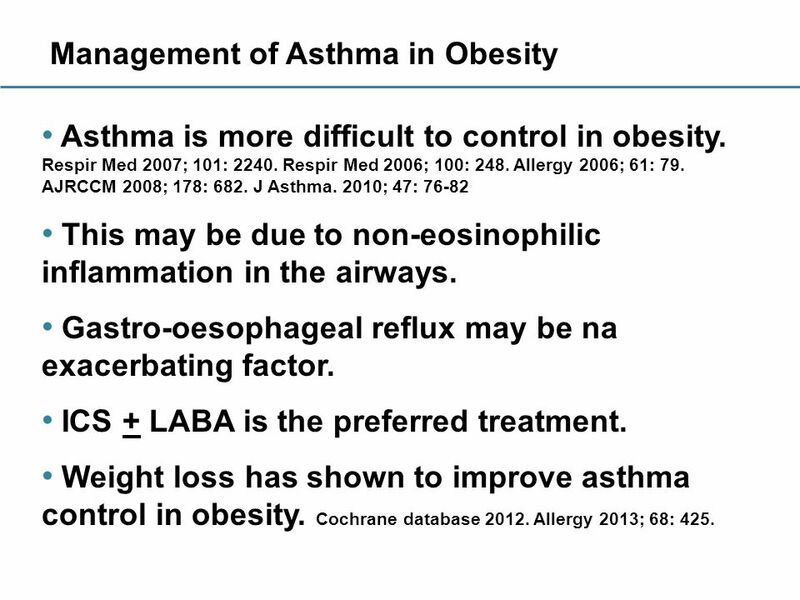 15 Management of Asthma in Obesity Asthma is more difficult to control in obesity. Respir Med 2007; 101: 2240. Respir Med 2006; 100: 248. Allergy 2006; 61: 79. AJRCCM 2008; 178: 682. J Asthma. 2010; 47: 76-82 This may be due to non-eosinophilic inflammation in the airways. Gastro-oesophageal reflux may be na exacerbating factor. ICS + LABA is the preferred treatment. Weight loss has shown to improve asthma control in obesity. Cochrane database 2012. Allergy 2013; 68: 425. 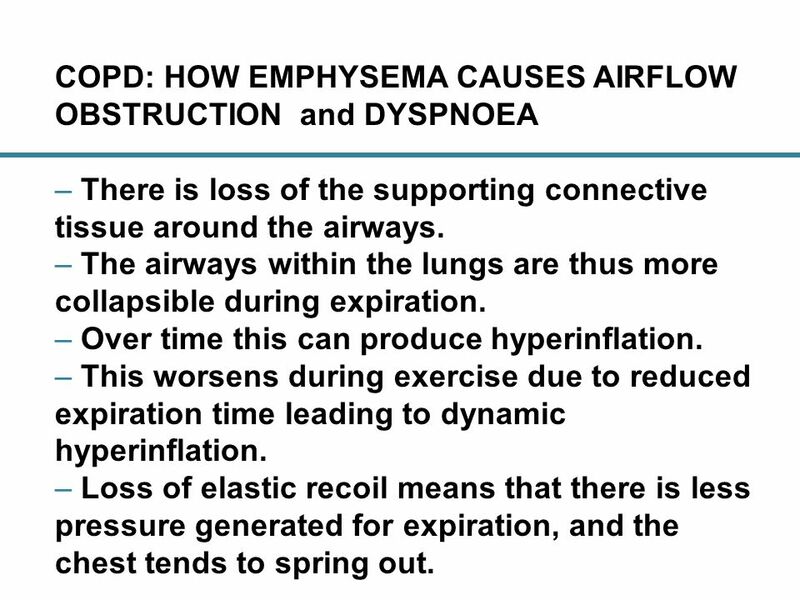 16 COPD: HOW EMPHYSEMA CAUSES AIRFLOW OBSTRUCTION and DYSPNOEA – There is loss of the supporting connective tissue around the airways. – The airways within the lungs are thus more collapsible during expiration. – Over time this can produce hyperinflation. 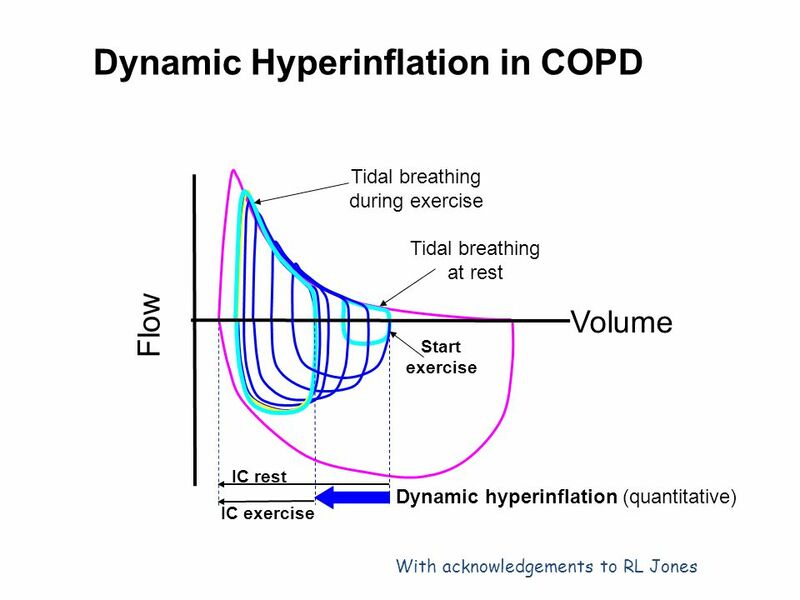 – This worsens during exercise due to reduced expiration time leading to dynamic hyperinflation. – Loss of elastic recoil means that there is less pressure generated for expiration, and the chest tends to spring out. 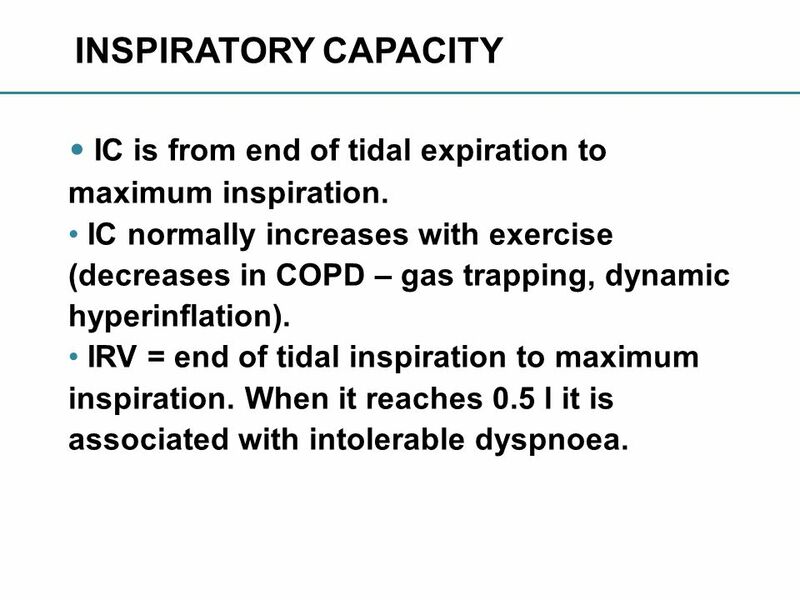 17 INSPIRATORY CAPACITY IC is from end of tidal expiration to maximum inspiration. 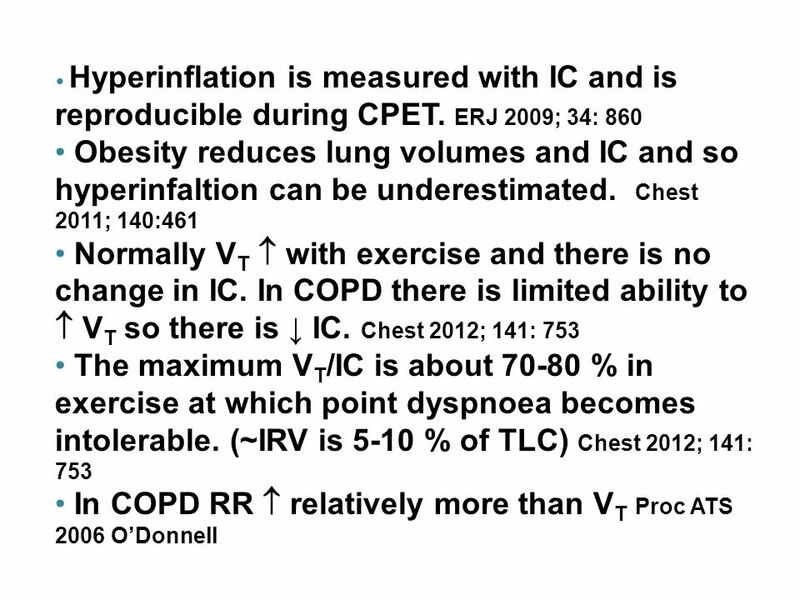 IC normally increases with exercise (decreases in COPD – gas trapping, dynamic hyperinflation). IRV = end of tidal inspiration to maximum inspiration. When it reaches 0.5 l it is associated with intolerable dyspnoea. 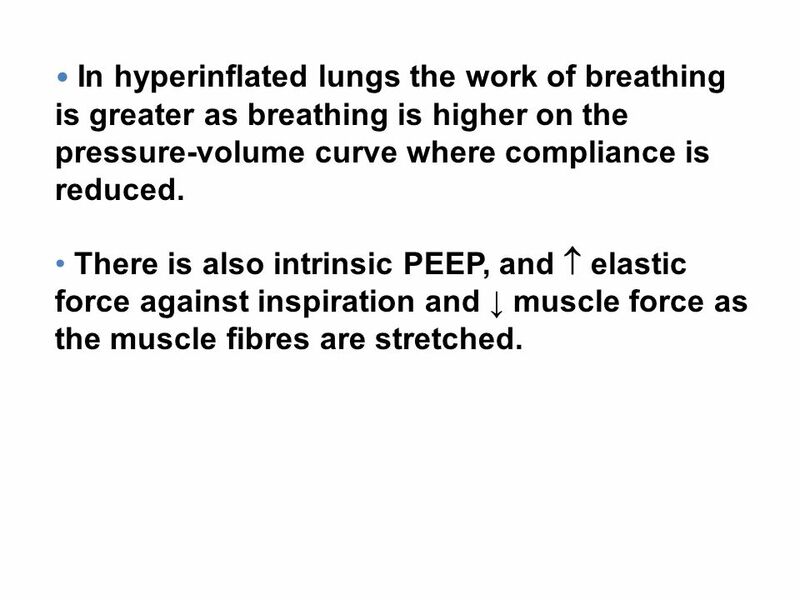 19 In hyperinflated lungs the work of breathing is greater as breathing is higher on the pressure-volume curve where compliance is reduced. 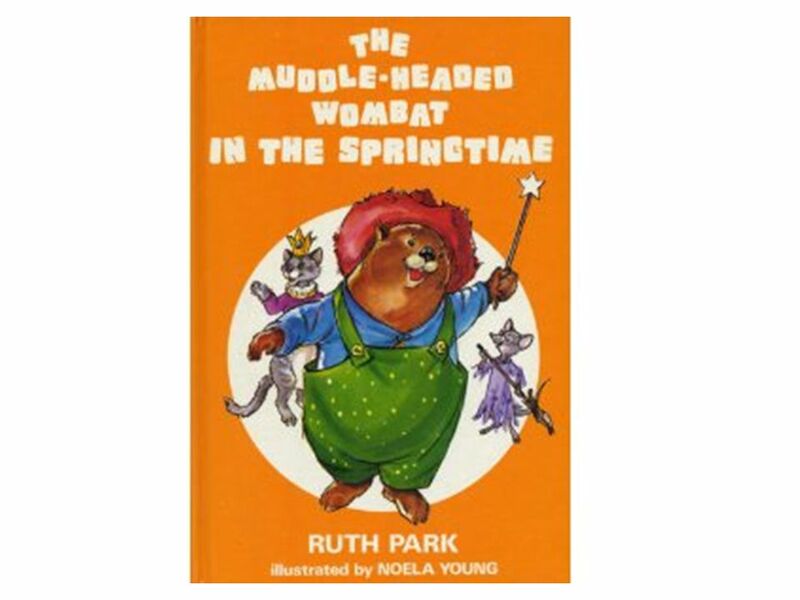 There is also intrinsic PEEP, and  elastic force against inspiration and ↓ muscle force as the muscle fibres are stretched. 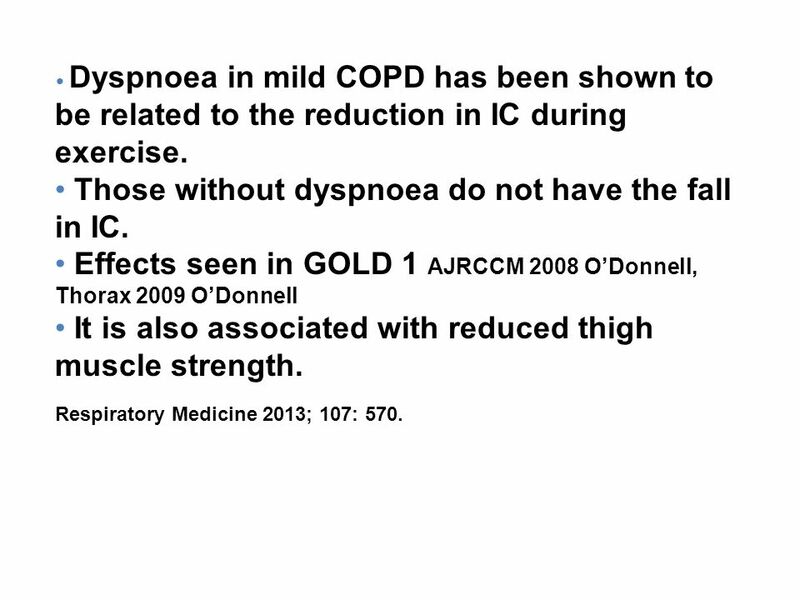 20 Dyspnoea in mild COPD has been shown to be related to the reduction in IC during exercise. 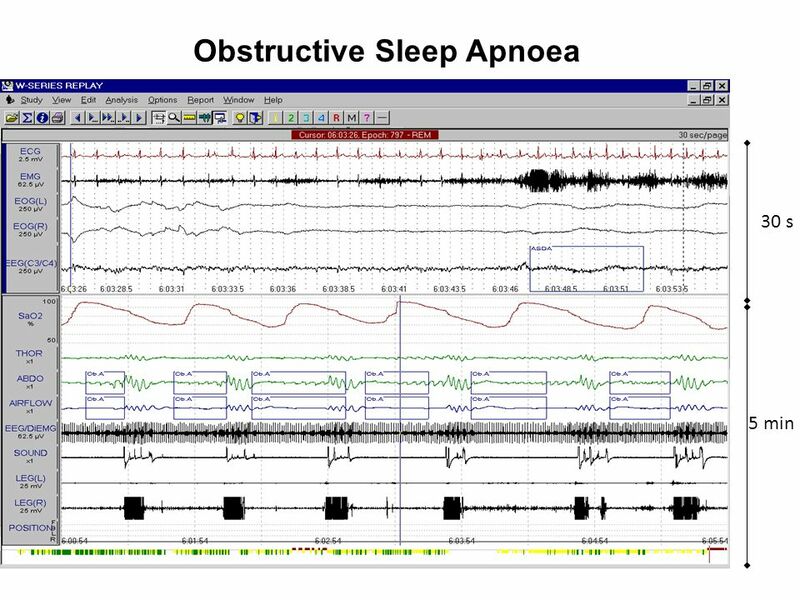 Those without dyspnoea do not have the fall in IC. Effects seen in GOLD 1 AJRCCM 2008 O’Donnell, Thorax 2009 O’Donnell It is also associated with reduced thigh muscle strength. Respiratory Medicine 2013; 107: 570. 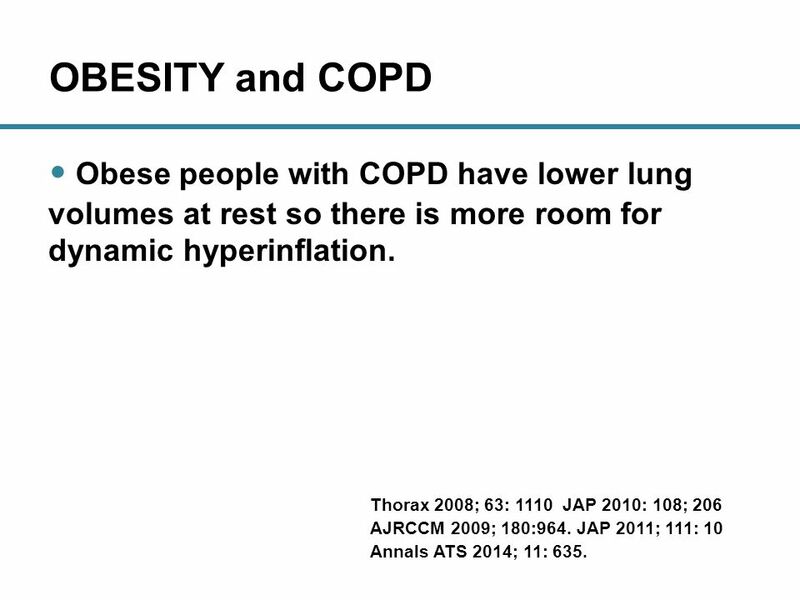 22 OBESITY and COPD Obese people with COPD have lower lung volumes at rest so there is more room for dynamic hyperinflation. Thorax 2008; 63: 1110 JAP 2010: 108; 206 AJRCCM 2009; 180:964. JAP 2011; 111: 10 Annals ATS 2014; 11: 635. 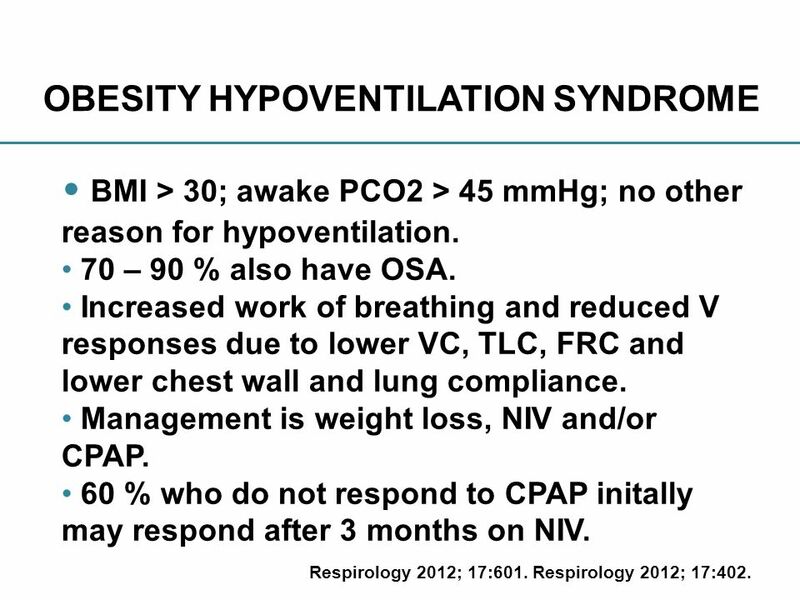 31 OBESITY HYPOVENTILATION SYNDROME BMI > 30; awake PCO2 > 45 mmHg; no other reason for hypoventilation. 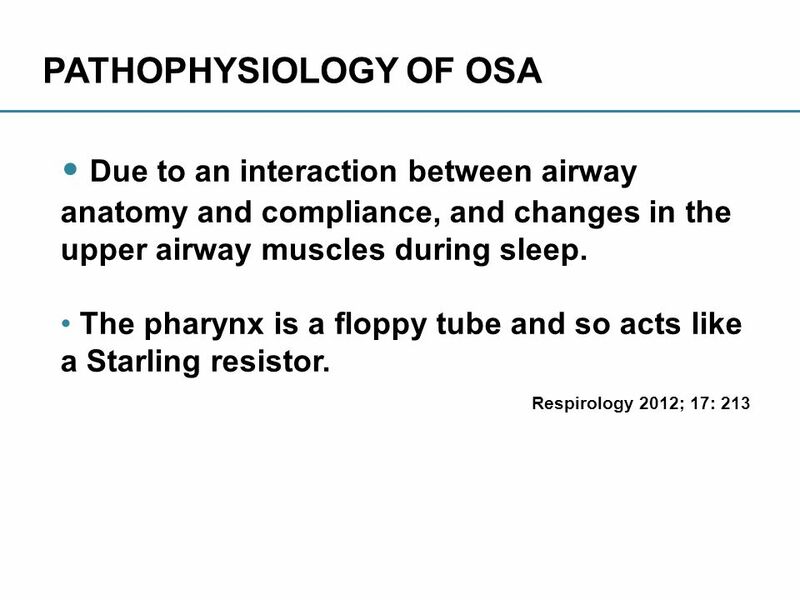 70 – 90 % also have OSA. Increased work of breathing and reduced V responses due to lower VC, TLC, FRC and lower chest wall and lung compliance. 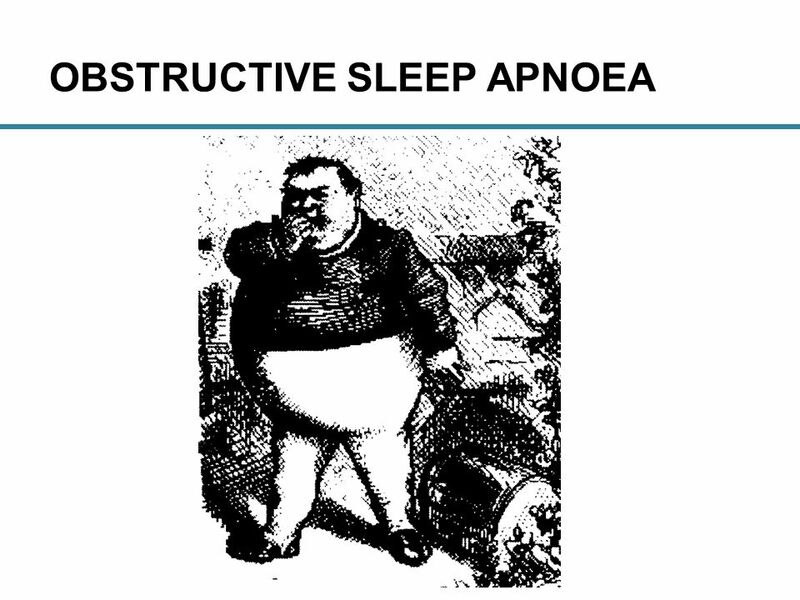 Management is weight loss, NIV and/or CPAP. 60 % who do not respond to CPAP initally may respond after 3 months on NIV. Respirology 2012; 17:601. Respirology 2012; 17:402. 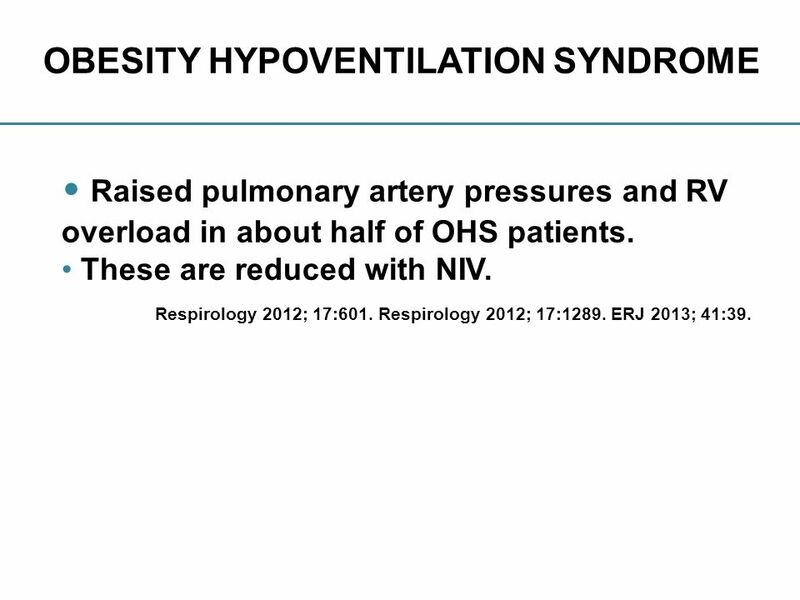 32 OBESITY HYPOVENTILATION SYNDROME Raised pulmonary artery pressures and RV overload in about half of OHS patients. These are reduced with NIV. Respirology 2012; 17:601. Respirology 2012; 17:1289. ERJ 2013; 41:39. 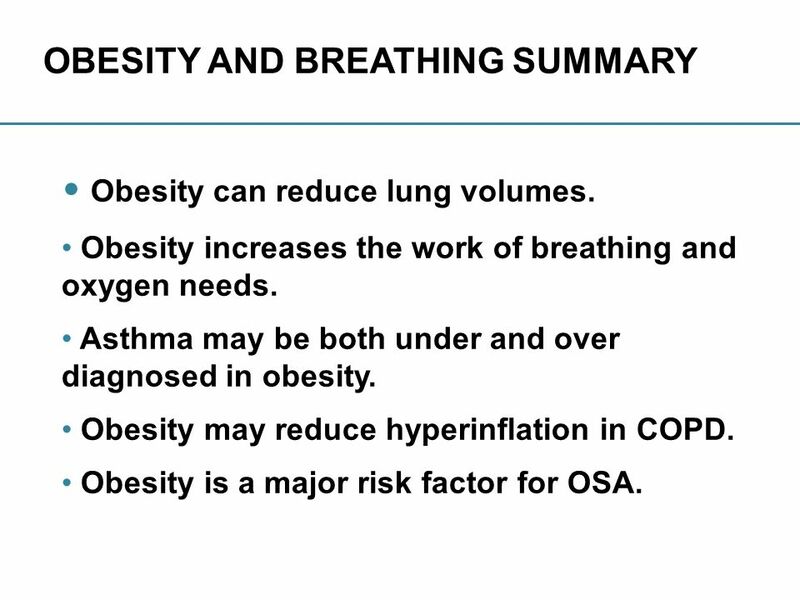 33 OBESITY AND BREATHING SUMMARY Obesity can reduce lung volumes. 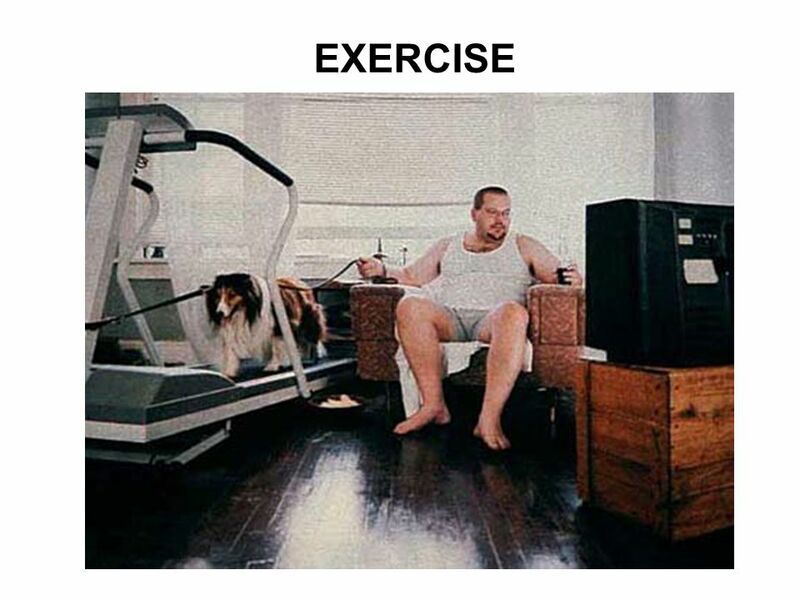 Obesity increases the work of breathing and oxygen needs. 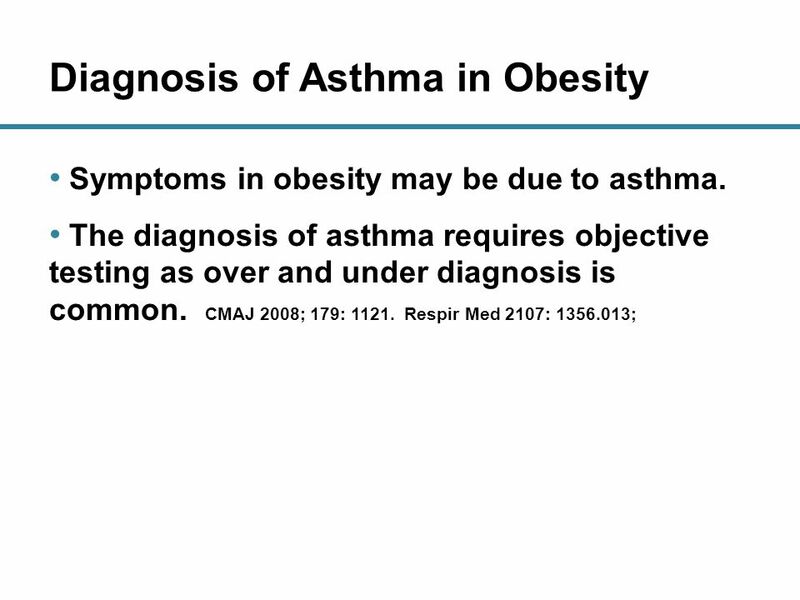 Asthma may be both under and over diagnosed in obesity. 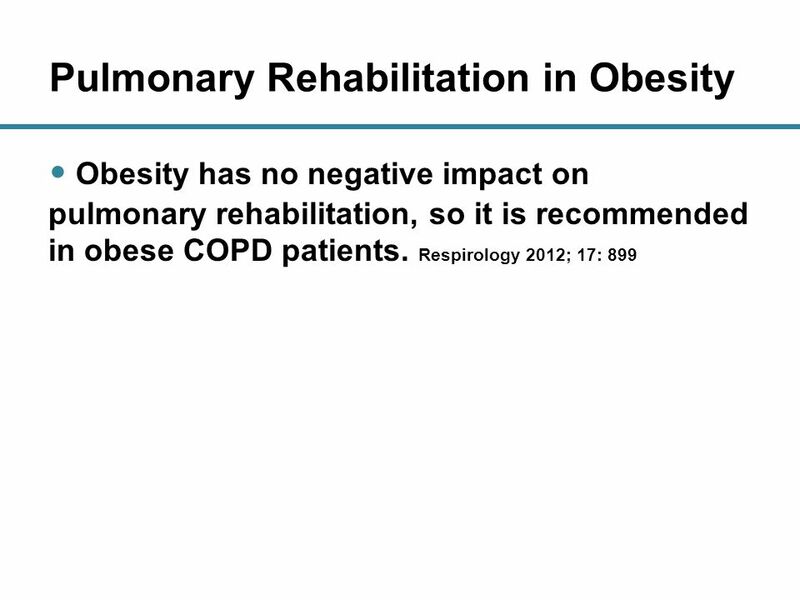 Obesity may reduce hyperinflation in COPD. 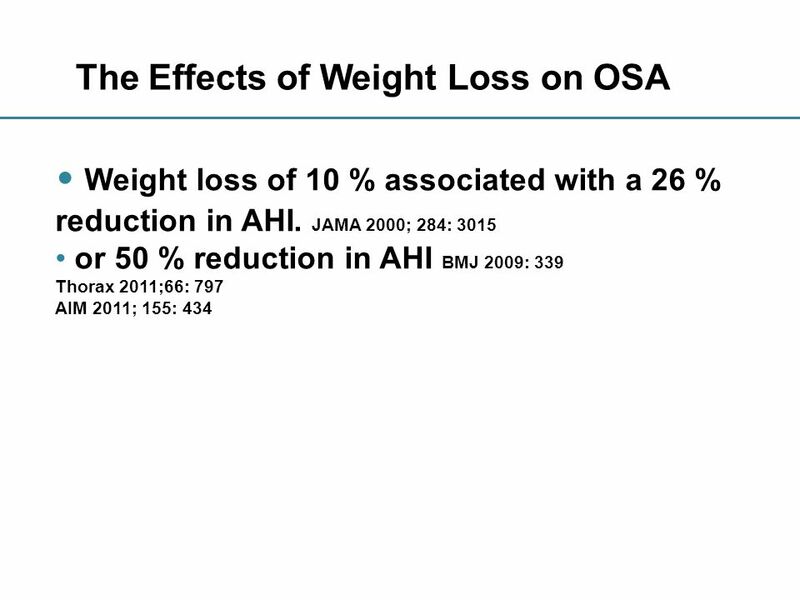 Obesity is a major risk factor for OSA. 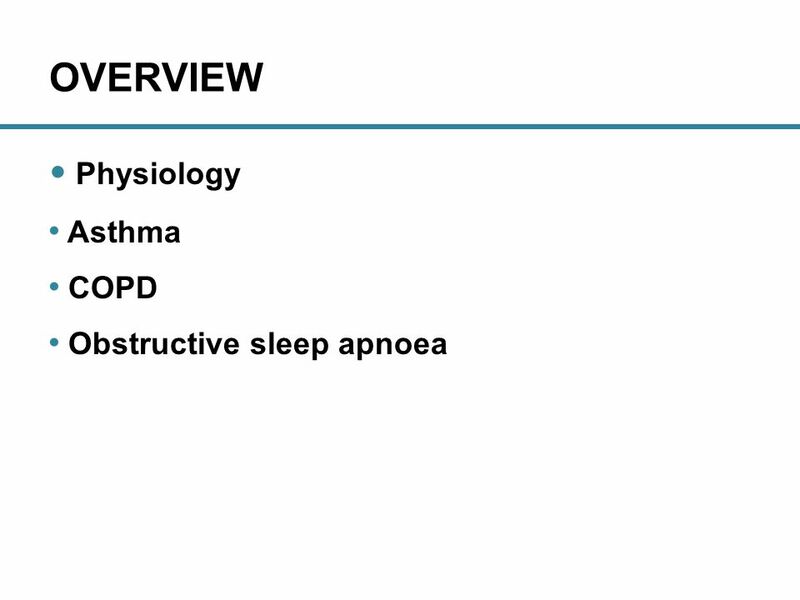 Download ppt "OBESITY and BREATHING Dr Christopher Worsnop Department of Respiratory and Sleep Medicine Austin Hospital, Melbourne, Australia." 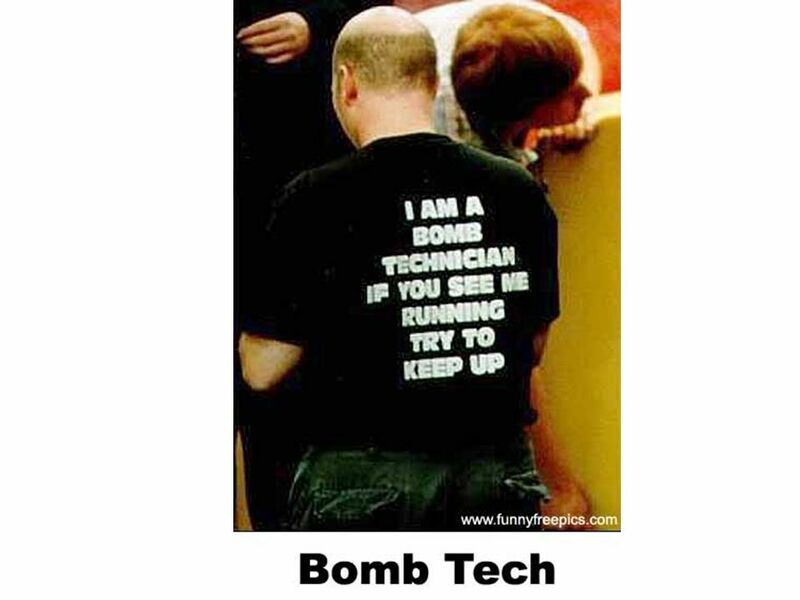 Respiratory Physiology. Respiration: General Purpose- To stay alive Speech is an overlaid function Respiratory patterns different for: –Breathing for. Pulmonary Volumes and Capacities—Spirometry A simple method for studying pulmonary ventilation is to record the volume movement of air into and out of. Lecture 2 The work of breathing Surface tension (ST) Role of surfactant Lung volumes and capacities Anatomical and physiological VD Alveolar space and. The Respiratory system Pulmonary ventilation – Chp 16 Respiration. 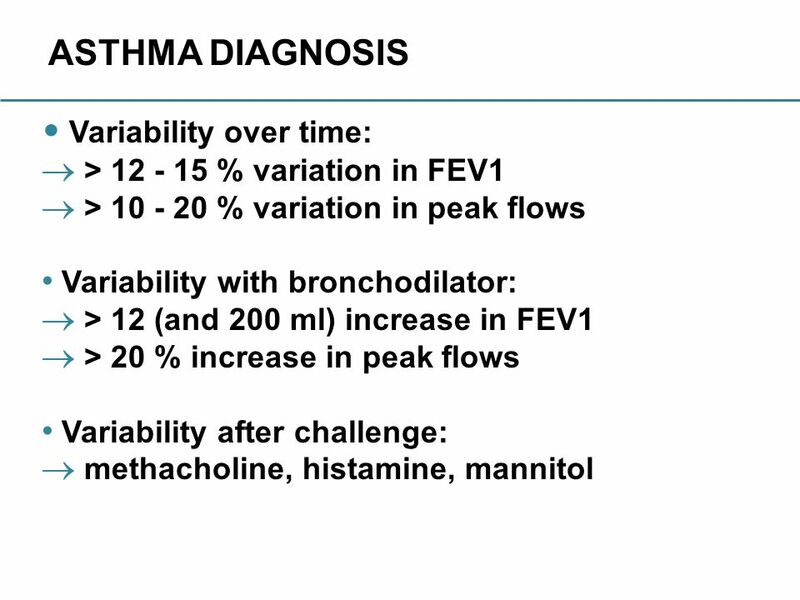 2005 PPC Lectures Series: Pulmonary Function Tests Kimberly Otsuka, M.D. Pediatric Pulmonary Fellow September 19, 2005. RESPIRATION Dr. Zainab H.H Dept. of Physiology Lec.5,6.